EPDM main feature is its excellent resistance to oxidation, ozone resistance and erosion resistance ability. And also insulation property is good. 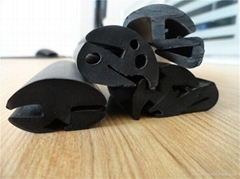 Based on the good property, EPDM is widely used in extrusion industry such as auto door seals and weather strip, sealing strips for windows and doors in construction industry and many kinds of strips used on machines. At present, EPDM is the most popular material for extrusion profiles. EPDM profiles include Solid Extrusions, Foam Extrusions, Solid & Sponge Extrusions, Solid & Flocking Extrusions, Rubber/Plastic & Steel Strip/Wire Composite Extrusions, Solid & Sponge & Steel Strip/Wire Composite Extrusions etc. window, machine and construction industry. Rubber seal could work during -40 centigrade to 260 centigrade. could protect the machine or parts to be healthy and working well. 3.The advantage of rubber seal: The flexibility and anti-aging capability of EPDM rubber seal is very good. Rubber seal is more flexible than PVC seal. The next is our test report from our quality control department.